'The Macedonian language is the language of the Macedonians in Australia, America, Canada, Switzerland, and Germany, and no one disputes that,' Zaev declared. North Macedonia’s Prime Minister, Zoran Zaev, has said that he agreed to change his country’s name and Constitution because PM Alexis Tsipras accepted the existence of a “Macedonian identity”. In a debate with opposition VMRO-DPMNE leader Hristijan Mickoski, Zaev also noted that Tsipras had initially accepted the name Republic of Ilinden Macedonia. Zaev said that the idea was scrapped due to an uproar among opposition parties in Greece. The name refers to an uprising that is widely viewed as the strongest symbol of the historical irredentism of Greece’s northern neighbour. Zaev said that the “Macedonian language” and “Macedonian identity” are “shining in the UN”. “The writing of the Macedonian language and of Macedonian identity is shining in the UN where they were registered without asterisks or footnotes. The Macedonian language is the language of the Macedonians in Australia, America, Canada, Switzerland, and Germany, and no one disputes that,” Zaev declared. “Macedonian is the language of Macedonians all over the world, in the diaspora and in the fatherland. It is the official language that is recognised everywhere. It is part of the identity of the Macedonian people as guaranteed in the Constitution,’ said the PM of North Macedonia. 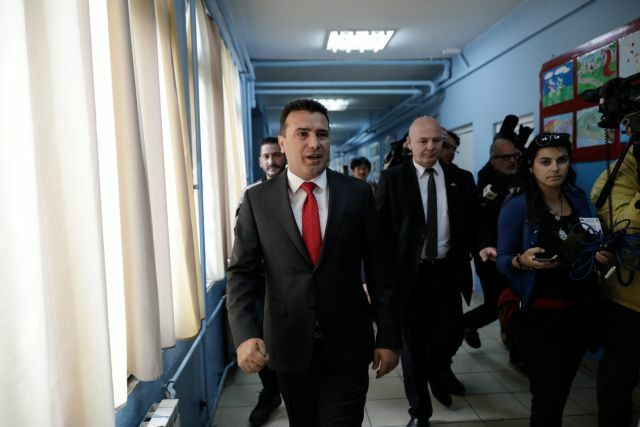 Zaev fiercely defended the Prespa Agreement on the grounds that it paves the way to the admission of North Macedonia and the EU, while Mickoski argued that the accord harms his country’s national interests. Despite being pressured by the moderator and Zaev to say whether his party will honour the agreement if it comes to power, the main opposition leader refused to answer.